Rugged lightweight stability for the table or any other surface, now with integrated Ball Head! This Table Top Tripod and Ball Head combo is perfect for point-and-shoot, mirrorless and DSLR cameras. Our brand new FEISOL TT-15B delivers ultra-lightweight design and incredible stability at the minimum height of only 11.8 cm (4.65 in) in its lowest setting. It sets up in seconds to provide a stable shooting platform which can be used in- and outdoors, shine or rain, on the ground, a wall, a rock, a vehicle, whatever is available. 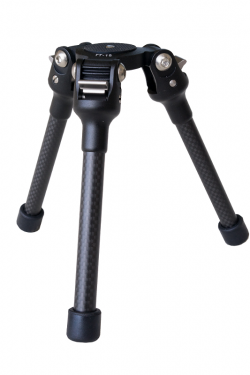 Remarkably lightweight constructed at just 0.40 kg (0.88 lb) and made of top-rigidity Carbon Fiber and CNC-milled solid block Aluminum components, this tripod and ball head kit is designed to effortlessly handle loads up to 8 kg (18 lb). – 3 preset leg angles at 25, 50 and 75 degrees. 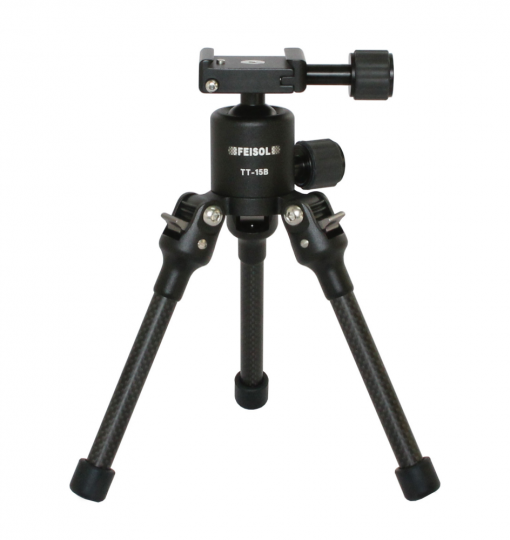 – Lower minimum height of only 11.8 cm (4.65 in) at lowest preset leg angle; it can go flat to the ground too. – 1/4″ and 3/8″ (adapter included) screw. – An extra stable one leg-section design. – Constructed of top quality Carbon Fiber and high grade, CNC milled solid block Aluminum. – Anodized Coating on Aluminum components to withstand the most punishing conditions without corrosion. – Rubber feet for non-slip operation. – A QP-144750 plate, tripod bag and allen eys for leg adjustment are included. The new FEISOL TT-15B Table Top Tripod and Ball Head system truly is the ultimate support system for any professional who needs lightweight and compact flexibility without being willing to compromise stability and quality.